8. High quality finish,without sharp edges. 9. With changeable panel for duplex or simplex adapter,easily combination with your real application. Adoptable adapter types: FC, SC,LC/Duplex. The removable front panels chassis is a 19 inch 1U sliding panel in two parts: one sliding chassis and one front panel, which receives the optical adaptors. The flexibility of its two piece construction allows you to maintain a stock of the chassis and then attach a suitable front panel as required. 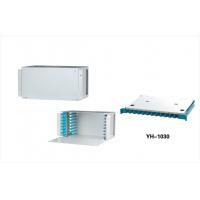 The cabinet has good performance of sealing with a protection level of IP65. 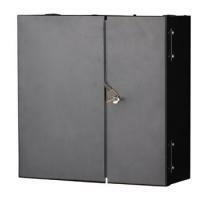 The cabinet is equipped with theft-proof lock, safety and reliability with good vandal-resistant function. 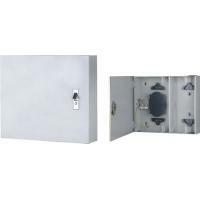 The cabinet has flexible cable inlet and outlet structure and internal connecting structure. All operations are fully done at front. Earth mode: the cabinet has two earth systems, one is protection earth by way of connecting the cable reinforcement with ground, and another is cabinet housing earth. The two earth systems are not connected with each other. They are separately connected with the ground of machinery house with their own earth wire. It is applicable to ribbon and common cable. The door of the cabinet can be equipped either only at front or both at front and back. There is adequate space for fiber distribution and storage, as well as enough fiber winding trays. Hanging hooks, which are convenient for user to operate. The direct splice area is specially equipped in the inside of the cabinet; the cables at two ends are connected in the direct splice area. Pressurization: there is no breakdown or flashover when pressurization≥3000V (DC)/1 min between the metal work piece of the cabinet and earth device. Each surface of the C can be bear bear a vertical pressure>980N. The outermost part of the door can be bear a vertical pressure>200N when the door is open. FTTx, FTTH, FTTB, FTTO, Telecom network, CATV.Provide fusion and storage appliance for optical cables,for indoor fiber optic cable distribution. Ningbo Yuhui Communication Equipment Co.,Ltd is established in 1995, is one of the leading communication equipment manufacturers in China. Our firm is located in Cixi city, close to ports of Ningbo and Shanghai. Up to now , more than 90 employees are working in our company and dozens of advanced technicians take company as home. 100% products are exported and it’s with 8000 square meters of production zone. As an ISO9001:2000 certificated company, 20% of staff members pay much energy for research and development ,Under this strict business organization, we are very welcomed with good products and quality,of course ,we have very warm service. 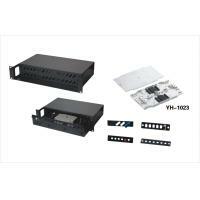 Our products are related to whole cabling telecom communication and internet system, such as network cabinet, distribution box, keystones modules,patch panel, kinds of modules and accessories. 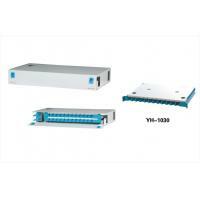 Also the fiber optic patch panel and other splicing items are our hot products. Through the joint effort of all our staff, our products have been well received by more than 50 foreign countries in America, Europe, Asia and Mid East. And our customers sing high praise for our goods. try our best to build the company as a word famous enterprise. Welcome to contact us, Ningbo Yuhui Communication Equipment CO., LTD will be the reliable partner for you!